HyperDrive4 RAM HD Is Faster Than The Millennium Falcon | OhGizmo! If you’re even a casual Star Wars fan, you probably know that the secret to the Millennium Falcon‘s speed in hyperspace wasn’t just the oversized engines: it was the computer. That being the case, the Falcon probably had one of these HyperDrive4 SSD arrays inside, since it’s the fastest internal HD in the entire universe. Or on earth, at least. 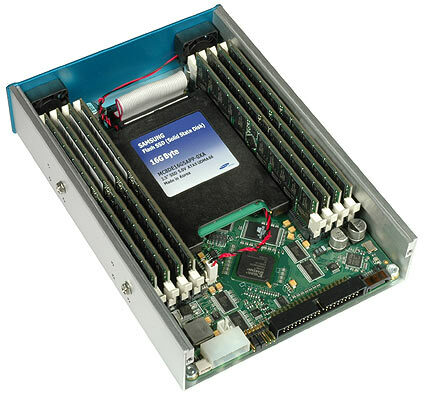 The HyperDrive4 fits into a standard 5.25″ bay with an IDE or SATA connector, and instead of conventional NAND flash ram, it uses sticks of DDR… Up to eight of them, at 2 gigs each. Let me throw some numbers at you: according to the manufacturers, the HyperDrive4 can find files 8,000x faster than a 10,000 RPM magnetic HD, and serve them 125x faster. In practical terms, that means a full install of Windows XP in 7 minutes, and a boot to desktop time of 2 seconds flat. The major (and it’s pretty major) downside (besides the starting price tag of $5000 for the 16gb version) is that the memory is volatile: in order to retain data, it has to be powered on all the time. I guess in some ways that’s a feature; when the RIAA breaks down your door, you can completely wipe your drives at the flick of a switch. But at the same time, any power loss gets rid of all of your data. That’s why the HyperDrive4 includes a conventional Samsung NAND Flash SSD to serve as a backup, but you’re still going to need a UPS and careful monitoring to prevent data loss and make the most out of the speed of the DRAM… Especially if you’re trying to make the Kessel Run in less than twelve parsecs. why use DDR? DDR2 is faster and cheaper and DDR3 way faster? Ah, a ram drive, finely. To bad it costs more than my computer cost. I’ll wait a bit longer, thanks. DDR memory is many times faster than the SATA interface. Why should they use an even faster and much more expensive memory when the bottleneck is the interface? Blasphemy! Nothing is faster than the Falcon!